Is it possible to audit the removal of a user from Azure AD from the perspective of the user being deleted? I.e if John Doe is removed from the AAD is it possible to search the directory for that removal on the name John Doe? It seems that it is possible to see that Jane Doe removed John Doe, but in that instance you need to know who deleted the account, which for an org of several hundred ops people is effectively impossible to do. Can audit on who removed the account, not the removed account. The Audit logs will contain the information you are looking for. The date/time, activity, status, target object, and the actor information are all available. If you navigate to the Azure AD, Users screen you will find the Audit logs option within the Activity section. From this screen you can do some pretty advanced filtering as well so you filter down the specific activity types (ex. "Delete User") or you can search by the target or the actor. When searching for the delete activity types, if you want to specify the target, you will need to search for it via the user's guid and not the username since the delete activity type will show a composite value of the guid+username. Of course, navigate to the Azure Active Directory in the portal -> Users -> Deleted users -> search by Name. I think it is possible. You could navigate to the Users -> Audit logs. Choose the filter like the screenshot, note the target should be the object id of the account which was deleted, then the INITIATED BY (ACTOR) is the one who deleted the account. If you have other requirements, just change the filter. 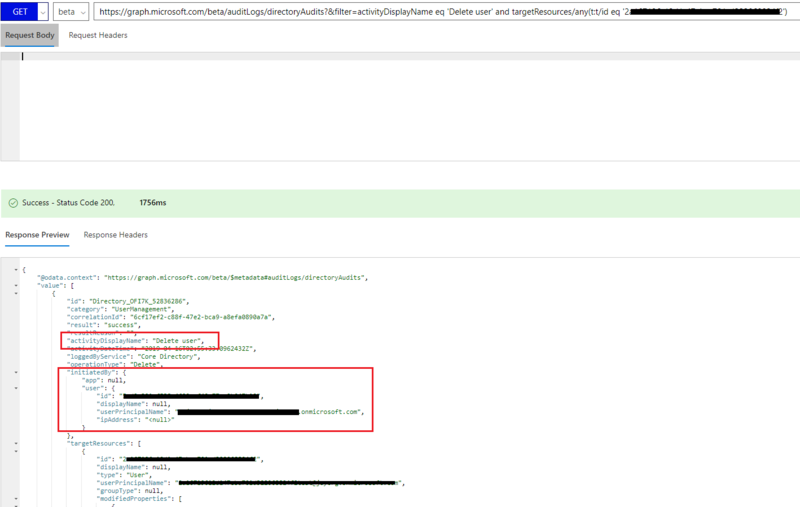 Besides, you can also use the Microsoft Graph API: List directoryAudits to get the one who deleted the account, the 2a167196-12dxxxxxxx068824f2 is the object id of the account which was deleted. How to get an Azure Active Directory username in Windows Powershell?